← Is there an offseason? The cria season has come to Fallengrund Alpacas. This year we have five expecting mothers in the range of a month. Currently, our eyes are on Hope who is showing enough signs that Farm Manager Allie has placed her in a maternity stall with her birthing buddy Moosie. 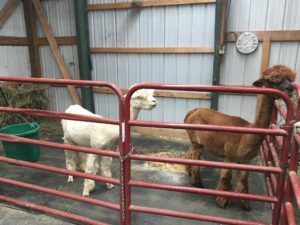 With alpacas being of the herd sort, they aren’t fond of being alone, even in stalls. Plus who couldn’t use a cheerleader when in labor? Instead of ‘Push, push, breath.’ the stall companion just hums. The arrival of the babies is always an exciting time. All of us are excited and nervous, waiting for the signs and photos and updates that come with an impending birth. Lynne and Michael move down to the farm so they are there along with Allie and Chris for the birth of each cria. And now with Instagram and Twitter, we’ll be able to share those moments with everyone. So be sure you are following on both of those as well as Allie-isms on the farm life. This entry was posted in Uncategorized and tagged Alpacas, Cria, Fallengrund Alpacas. Bookmark the permalink.